"If I could at least give you the tools so that you could course-correct while you're following a recipe...that was really my goal"
This week, we're excited to welcome Samin Nosrat to SALT + SPINE, the podcast on stories behind cookbooks. 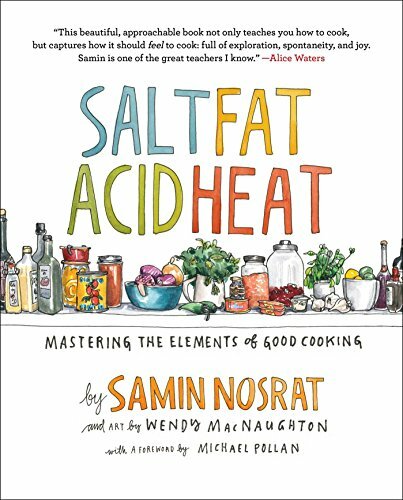 Samin Nosrat is a writer, chef, teacher and author of Salt, Fat, Acid, Heat: Mastering the Elements of Good Cooking. The book was born from a realization in the Chez Panisse's kitchen very early on -- that the key to good cooking could be distilled into four simple elements. It's a work that's been widely celebrated and earned her a James Beard Award. We were fortunate to grab some time with the busy Bay Area resident, who has been on the go a lot recently. She shares her journey and the long road to turning her cooking philosophy into the simple and beautifully illustrated book. Plus, how she uses her writing to amplify the rich and diverse people in kitchens everywhere whose work and talent often aren't in the spotlight.